Our home and, folks tell us with their wonderful reviews, very charming and warm old island home - with recent historic designation - is located a few yards from the beautiful 100-yard path to the beach and is just 20 minutes from Charleston. Kitchen and dining equipment, paper goods, lots of beach chairs, boogie board rafts, an outdoor BBQ, towels, linens, laundry room. Sullivan's Island is across the Inland Waterway from Charleston with semi-tropical terrain, wide, sandy beaches, historic Fort Moultrie, a lively and varied restaurant area, public tennis courts and an old-time playground with grandstand gazebo. Go crabbing, fishing, kayaking, canoeing, windsurfing, and sailing in the ocean or in the inlets and creeks leading to the inland waterway. Sullivan's Island is the site of novels of many well-known authors: Edgar Allen Poe (The Gold Bug), DuBose Heyward (Porgy and Bess), and Pat Conroy (The Prince of Tides). Just 9 yards away from the footpath to the beautiful beach on the Atlantic Ocean, the duplex's upper level has private entrances, four bedrooms (one King, two with double beds, one with twin beds), two indoor bathrooms, one outdoor shower, and comfortably accommodates eight people. Living room, dining room; Ceiling fans in each room. Central Air Conditioning/Heat. Large screened front porch; Rooftop Deck with 360 degree views of the ocean, the harbor and the island. The large, screened, front porch with plush furniture serves as a second living area. 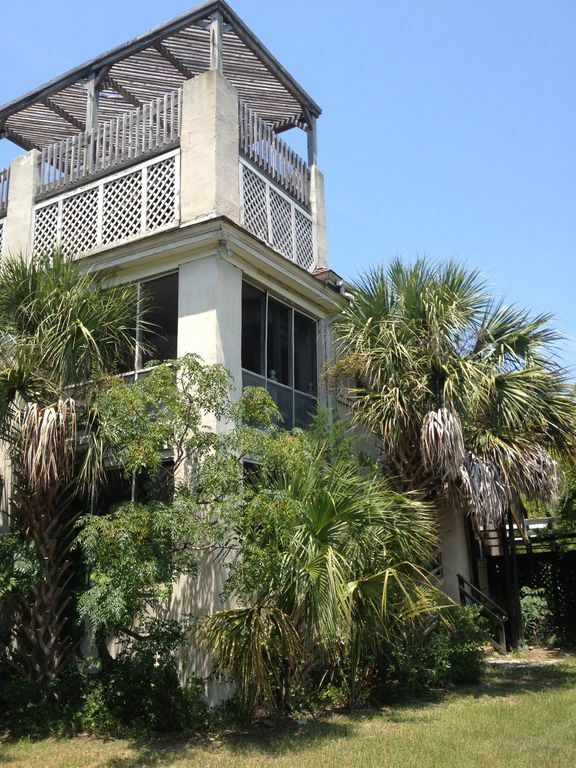 A winding staircase at the end of the porch leads to the rooftop deck with comfortable lounge furniture and gorgeous 360-degree views of the island and of the ocean, if the Palmetto Trees and don't need trimming!!! Cancellations: Full refunds will be made if property can be rented to someone else. You will talk directly to the owner about refunds. Our father built this house over 80 years ago, and to brag for him, it's survived every storm having lost only two shingles - even the terrible Hugo in 1989! Our charming, old island house is about 130 yards from the very wide and beautiful Sullivan's Island beach and about 20 minutes from historic Charleston SC . Lots of history on the island from Fort Moultrie, the site of the first shot of the Civil War, Revolutionary War sites, to sites of Edgar Allen Poe's many stories for which the island was his inspiration.